Alan Charlton, 20 Vertical Parts, 1990/2017, acrylic on canvas, 88 1/2 x 14 1/4" each. This new, multifaceted exhibition of Alan Charlton’s work speaks to the continued vitality and richness of his production. In the late 1960s, the English artist was already pioneering a language of radical abstraction. 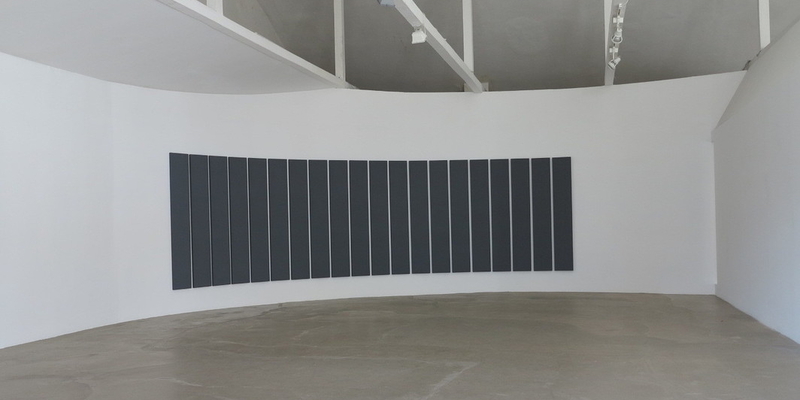 Since that time, he has adopted gray as the distinctive and sole color in his practice––a color which embraces neutrality in opposition to representation and expression, but whose eminent urban overtones also explicitly connect his paintings to industrial culture. The large curved wall at the gallery’s entrance offered an opportunity for the artist to stage a new installation of his monumental 1990 work, 20 vertical parts, originally conceived as a “corner painting.” Made up of twenty identical elements, the piece puts forth a dialectic of plurality and unity following a pared-down methodology: Every component has been meticulously painted to achieve the most uniform effect possible. Furthering Charlton’s rejection of gestural expressivity and subjectivity, both the dimensions of the works’ individual elements and their distance from one another are basedas is always the case in his pieceson a 4.5-centimeter unit: the standard thickness of a stretcher frame in the United Kingdom. These same dimensions guide the other works on view, all created for the show. In the second room, the diptychs in “Light and Dark,” 2017, each have two elements of the same size, one light and one dark, seemingly contradicting and modulating serialism. The show’s final section features Isometric Triangle, 2017, paintings on unstretched canvas, hanging freely on the wall and deliberately arranged nonsequentially.